Microsoft Azure : Deploy SharePoint Server 2016 VM Step By Step Tutorial With Training Video. ~ Microsoft Azure Step By Step Tutorials And Free Online Training Videos. Microsoft Azure : Deploy SharePoint Server 2016 VM Step By Step Tutorial With Training Video. Lets have a look at step by step free procedure of how to install and deploy SharePoint Server 2016 VM in Microsoft Azure Public Cloud infrastructure with the help of azure web based user interface resource manager deployment model. We require a domain contoller network, servers added to that domain and a sql server ready for creating a test farm in our SharePoint server. We will first deploy SharePoint server 2016 in azure arm by selecting the SharePoint server 2016 image from the gallery. Then we will identify the hostname for the server vm, choose vm disk type, set login credentials for vm, select the azure subscription, resource group and location. Later we will select the VM hardware configuration size and then choose the availability set group for HA, storage type, virtual network, subnet, public ip, nsg firewall endpoints and other required details. Once everything is finalised we will validate the same and click on purchase. Once the VM deployment is successful, we will login to the machine via rdp console and join the server to our domain controller. Our server is up and running fine with SharePoint application installed. Now we will fo to server apps and click on Sharepoint 2016 Products configuration wizard and configure the same. We will create a new test server farm in the vm and provide our database sql server hostname details which we created in our last training exercise module, provide domain login credentials for accessing the sql database, define port number and configure security settings for web applications. So we have planned above steps and lets proceed further with actual installation. Free Step by Step Install Procedure to Reset forgotten administrator password of VM in Microsoft Windows Azure Cloud Infrastructure using Azure Resource Manager ARM web based user interface GUI. Step 02 : Click on Virtual Machines in the left panel. Step 03 : Click on add tab at the top to create new VM as shown in the screenshot. Step 04 : Select Sharepoint Server 2016 from the gallery and choose resource manager deployment model on the right hand side of the screen and click on create. Step 05 : Type VM hostname and select VM disk type SSD or HDD, login credentials, subscription free trial or paid, resource group, location and click on OK. Step 06 : Choose VM hardware sizing and click on select. Step 07 : Select HA availability set, storage, virtual network, subnet, public ip, network security group, other details and click on OK. Step 08 : Click on purchase after VM validation test is passed. Step 09 : New Sharepoint Server VM has been deployed successfully in Azure ARM. Step 10 : New Sharepoint Server VM is ready along with our Domain controller and SQL server machine in Azure ARM. We require a domain controller and a SQL server for further installation of Sharepoint Server Farm. Step 11 : Now login to Sharepoint Server VM and join it to our domain for new sharepoint farm creation. Step 12 : After joining Sharepoint Server VM to domain just reboot the server. Step 13 : After reboot, login to Sharepoint Server VM and click on Sharepoint 2016 Products configuration wizard. Step 14 : Click on next to configure SharePoint 2016 Products and create a new farm. Step 15 : Click on yes to restart the dependency services. Step 16 : Select Create a new server farm and click on next. Step 17 : Type in our database server VM hostname, domain login credentials and click on next. Step 18 : Specify port number and configure security settings and click on next. Step 19 : Click on next to complete the configuration wizard. Step 20 : Sharepoint configuration in progress. Step 21 : Sharepoint configuration completed successfully. Click on Finish. Step 22 : Sharepoint Farm partially created and now you can proceed ahead with creating first sharepoint site which is not part of our topic. Thus we have successfully installed and deployed Sharepoint Server 2016 VM Virtual Machine in Azure ARM. 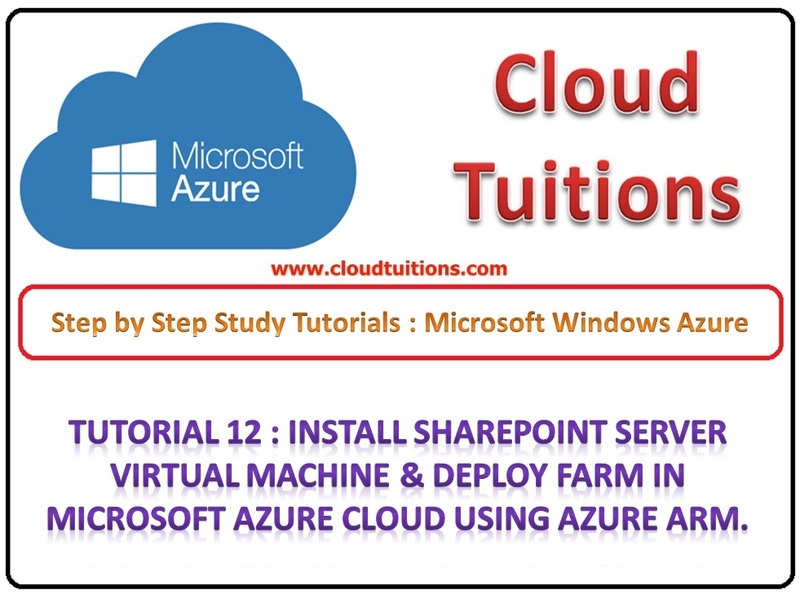 Watch Step by Step Microsoft Azure Free Youtube Video Tutorial on How to install and deploy Sharepoint Server VM in Microsoft Azure Cloud using Azure Resource Manager ARM.